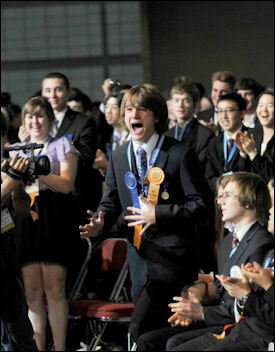 He is only a freshman at North County High School in Anne Arundel County , Maryland . However, 15-year-old Jack Andraka is being recognized for developing what may become an effective way to detect pancreatic cancer. Jack’s research has attracted the attention of Dr. Anirvn Maitra of the Sol Goldman Pancreatic Cancer Research Center at the Johns Hopkins University School of Medicine. Maitra agreed to let the teen test his paper in his lab, after nearly 200 other researchers rejected Andraka’s request for help. He has also won $75,000 as the grand prize winner of the Intel International Science Fair. The filter paper he designed is coated atom-sized carbon tubes that can detect mesothelin, a protein that is found in very high levels in the blood of people who have pancreatic cancer. “I’ve also been touched personally from pancreatic cancer. I know a lot of people who have died due to it. It’s really a death sentence when it’s diagnosed late, so I wanted to make a way to diagnose it early, such that less people would die due to it,” Andraka said. He adds that blood tests are the most common way to detect for pancreatic cancer. Andraka has patented his idea, which he says can also be used to detect which drugs are resistant to cancer. He says it took two months to develop his idea and that a bio tech firm in San Diego has been interested in his test will help perform clinical trials on his product in order to win FDA approval. He says he hopes the paper can be used to detect other cancers. Jack wants to become a pathologist. Folks, are you kidding me? How can we have nothing but the greatest of hopes for the future?! The Gospel supports, encourages, and releases this kind of wisdom. Why? Because God literally resides in every human temple. It’s just a question of placing those temples in an atmosphere free of guilt and judgment in order to release that kind of God-imputed wisdom to this Earth which is so in need. Now, let’s together see a world manifested where children are free of mental, emotional, religious, and spiritual abuse to discover and lead us to a new day.